MicroSurvey Software has opened a state of the art training facility to meet the demands of our customers. MicroSurvey Center is located at our corporate headquarters location in Kelowna, BC, Canada. The Center has been designed to accommodate 16 students comfortably surrounded by the best technology available. With its theater like atmosphere, students are fully engaged with the instructor's lesson. Click here to learn more about MicroSurvey Center. 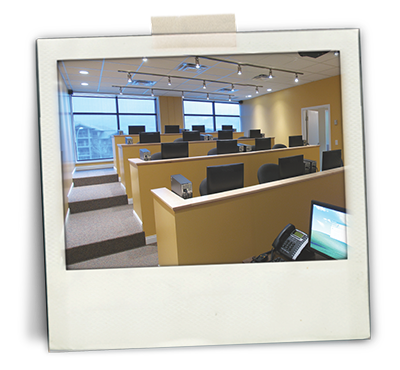 Classroom training sessions take place at MicroSurvey in Kelowna, British Columbia, Canada, and in other cities based on demand. Each student works on a separate computer with class size ranging from 9 to 16 students. A smaller classroom allows the instructor more interaction with the students and ensures that everyone moves along at the same pace. An online environment that allows for screen sharing and audio discussion between attendees and instructors. Increase the productivity and value of your company without the expense and downtime of traveling to the training facility. "Coming from the guy who's doing most of the CAD work, Glen did a great job. He did very well at explaining to those with minimal CAD experience the basics, and for the ones who use this program on a regular basis, he was able to isolate issues that we had and will have with this specific project. Most of what we went over in the course was already known to myself in one shape or another but several tips that Glen gave to me will exponentially increase my efficiency for the remainder of the project." For more information click here or call us at 1-800-668-3312.